Expert System develops software that understands the meaning of written language. The Forrester Wave report shows how each of the eight most significant AI-based text analytics platforms providers measures up against 22 key criteria and helps application development and delivery (AD&D) professionals working on text analytics initiatives make the right choice. The new Forrester Now Tech Report helps companies to understand the value they can expect from a social listening platform provider and select vendors based on size and functionalities. Learn how semantic technology can really understand meaning and context in information. Use Cognitive Computing to gain a better understanding of unstructured content. Learn how semantic technology allows for better content processing and interpretation, therefore enabling content organization and navigation, which in turn increases findability. Cognitive computing, natural language processing and text analytics bring tremendous cost savings and customer satisfaction advantages through the intelligent automation of time-intensive manual processes. GDPR compliance projects have a noticeable impact on the information management processes of any organization. Applied to the industry’s most resource-intensive processes, it is delivering unprecedented productivity gains and insight, and leading to deep changes in how insurers do business. Information is a financial organization’s most important asset for ensuring profitability and growth. Cogito cognitive computing technology is perfectly suited to analyze SARs for compliance reporting and risk management. 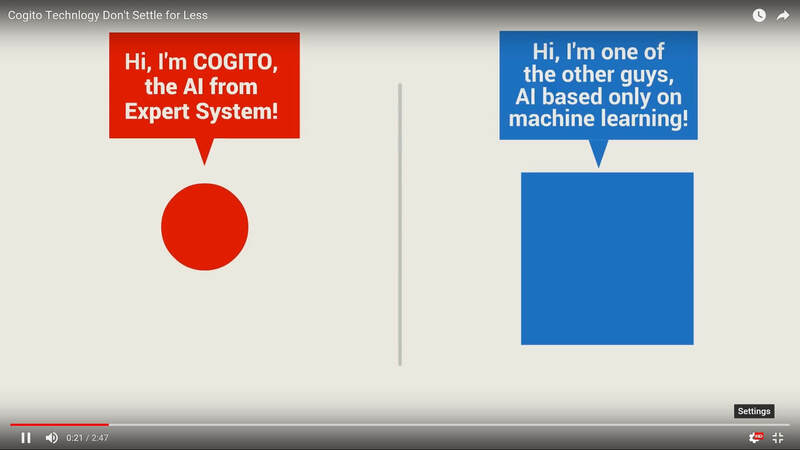 Cogito brings an understanding of the meaning of words in context in a high-performance Platform built for processing large quantities of text with the highest precision. Maximize your content to reduce costs, boost monetization and increase editorial productivity. We’ve tagged over a billion documents for some of the largest, global Oil and Gas companies; you can be confident that we can handle the scale and complexity of your content. A scalable and expandable data-driven infrastructure powered by cognitive technology provides access to knowledge for the individual patient, for new diagnostic tests, treatment protocols and solutions that ultimately reduce healthcare costs for the long term. Discover the advantages of Chatbots based on Expert System’s cognitive technology. Cogito Discover reads and understands content and translates it to a form that illiterate systems can understand. Cogito Intelligence Platform is the only software that puts the analyst first, providing multiple scenarios as data emerges, with immediate visualization of content. Cogito Answers is software that understands meaning and context in language to simplify the support process for both your customer and your staff. Cogito for Claims & Underwriting brings intelligent automation to claims management and underwriting processes. Cogito Studio combines the ability to apply semantic emphasis and interpretation to language and programmatic logic to achieve precise understanding and the ability to assert your priorities by leveraging technology. Cogito Studio Express allows you to quickly import thesauri and vocabularies, and you can immediately preview how the ontology applies to content. Biopharma Navigator explores the biopharma data landscape through user-friendly analytics and visualization, charting your answers in a few clicks.